HA: Rachel, welcome back to Homeschool Authors. Rachel: Thank you. I am delighted to be visiting again. Rachel: Someone else’s opening line inspired Duty. I was hosting a contest to celebrate my blog’s 100th. Entrants submitted possible opening lines, I chose one, and the prize would be a short story beginning with the winning opening line. Well, the estimated length ended up being a bit low. Rachel: My mother, who is a tough critic when it comes to books, said it was the best I have written so far. That made my day. Rachel: I am currently reading The Secrets of Gwenla by Laurie Penner. Next on my list is Five Glass Slippers: A Collection of Cinderella Stories. Rachel: Besides the Bible, I have a very hard time choosing. Jane Eyre by Charlotte Bronte and Rose in Bloom by Louise May Alcott have both been long time favorites. Rachel: I just finished writing Honor, the sequel to Duty. It tells part of the story of Simon Cordale the Earl of Dentin. In Duty, he comes across as a harsh character at times. He can be strong willed, opinionated, and hard to understand, which made him a very interesting character to write as a romantic lead. Also, finding a woman who balances him well became quite a challenge. His leading lady manages it beautifully. She doesn’t let him bully her and can be just as stubborn as he is. “Pardon,” I quickly rose, pulling the heavy chair out for her. Her eyebrows rose. I didn’t get a chance to guess why before she turned her face away. Once she was seated, I returned to my place. The first course arrived. As custom dictated, I offered first cut to her. She accepted it graciously, but made no move to eat. “Are you not hungry?” I asked as I lifted a bit of meat to my mouth. She didn’t respond, sipping some of the water in her cup instead. I watched her as I chewed. The growing patch of rose on the curve of her cheek indicated she knew of my scrutiny. Tomas remained absorbed in conversation with Brielle so nothing distracted me from my natural curiosity. I almost bought her act until I detected a twitch about her mouth. HA: What should readers expect when they read Duty? Rachel: The story focuses on the relationship of the heroine, Brielle, and the Earl of Irvaine who married her by proxy, sight unseen. Plucked from everything she has ever known, she must forge a relationship with her new noble husband who acts more like a common soldier than a nobleman. Romance, adventure, and action, the story doesn’t stop for a moment as the pair struggle to settle into their new duties. Rachel: I really appreciate this community of homeschool authors. It has been a blessing to meet others who share the love of written words and the common background of being schooled at home. 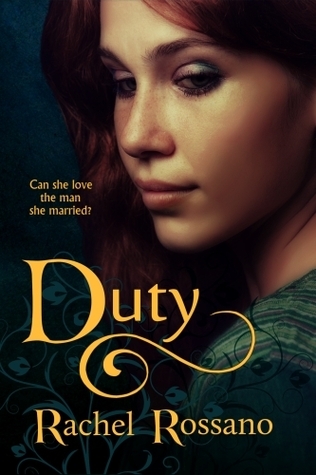 You can pick up a copy of Duty for $0.99 this week. Read it, Review it, and enter for a chance to Win it! I loved this book! I bought it Kindle on Amazon several months ago and was riveted. The idea of marrying a complete stranger and what that would be like is so foreign to our modern American minds. I think the closest we have ever come to imagining it is in the story of Esther, and we don't exactly get to read her personal diary. I look forward to being able to get a hard copy of Duty sometime soon. Looking forward with excitement to more books from Rachel!